We are open for business today in Forfar. 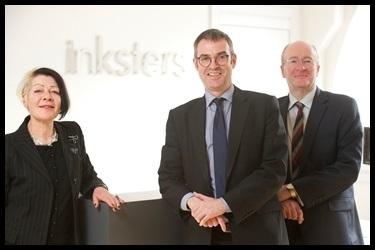 Robert Wild and Joanne Romanis join Inksters from Bowmans to establish our new Forfar office at 24 West High Street. Robert Wild acts for a wide range of clients throughout Angus and beyond. He is experienced in acting for individual and family clients in house sale and purchase as well as the preparation of wills and powers of attorney, and advises a number of businesses and local organisations in all matters including business set up, acquisitions and disposals, and the lease and purchase of commercial property. Robert has a particular interest in the agricultural and renewables sector and has successfully guided several of his farming clients in the funding and establishing of their renewables projects. Joanne Romanis is accredited by The Law Society of Scotland as a Specialist in Family Law and she specialises in high net worth/complex finance and difficult divorce/cohabitation cases. The new Forfar office adds to Inksters existing spread of offices throughout Scotland in Glasgow, Inverness, Portree, Wick and their visiting base in Shetland.